With thorough industrial knowledge, we are engaged in manufacturing and supplying of a wide range of helical compression springs. 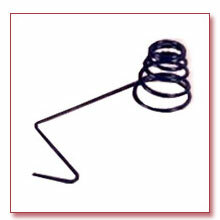 these springs are known for their capability of resisting compressive loading and high tensile strength. Our range is designed in a manner that these are generally of similar diameter and are parallel sided. We make use of wire cross sections to manufacture these helical compression springs that have high endurance and high compression absorption.